By default, all shipping methods you set up are available to all customers of your store. If you have methods that you want only some customers to access, though, you're in luck, because Volusion lets you make methods available only to the customers of your choice. Read on to learn more. In the Advanced Settings section, change the Allow Shipping Method Restrictions option to Enabled. That's it! Now you need to decide which method(s) to restrict. 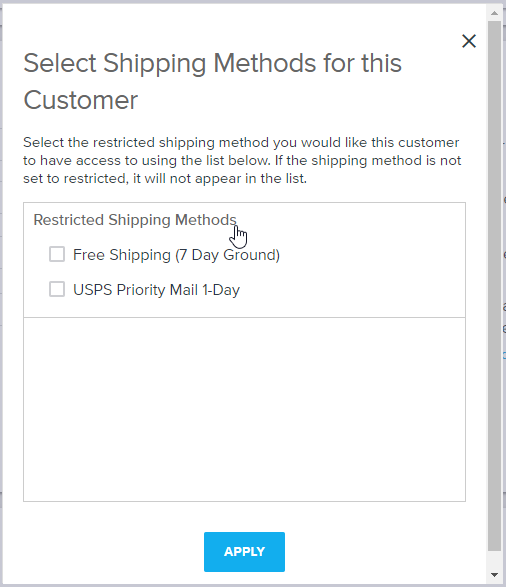 Select the shipping method(s) you want to restrict. In the Advanced Settings section, select Restrict Method. Go to Customers > Accounts. Select the customer account you want to provide restricted shipping method access to. In the Special Privileges section, next to Allowed Restricted Shipping Methods, press Select Allowed Shipping Methods. In the dialog box, open the Restricted Shipping Methods section. Select the restricted method(s) you want the customer to have access to. Press Save on the customer record. The customer now has access to the selected method(s) that other customers can't see! In the Name field, type "free shipping". On the results page, in the Allow Free Shipping Restriction row, in the Value column, select the option. Select the customer account of your choice. In the Special Privileges section, select the Disable Free Shipping Access option. The customer can no longer receive the free shipping option that all other customers can.